Tom Odell has worked as a goldsmith and metal sculptor for over 40 years at his home and studio in Chatham, MA. In 1973, after a four-year apprenticeship with jeweler Bernard Kelly, he began producing a line of jewelry in sterling silver and gold, and in 1975 he opened up a gallery with his wife Carol, a fine arts painter. In 1978 he began producing larger scale sculpture in steel and stainless steel. In 1986 he arranged to study Japanese metalworking and patina techniques for a year with master metalsmith Shumei Tanaka in Kyoto Japan. In 1994 he began working with lost wax bronze casting and in 1999 spent two semesters in the foundry at Mass College of Art. Commissions for outdoor larger sculpture are continuing as well as custom jewelry designs. His most recent sculptural works are represented in Deborah Forman’s recently published book, Cape Cod Contemporary Artists; On Abstraction. 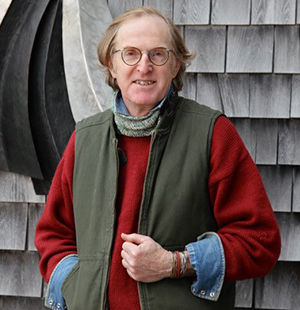 His work is in many private collections, the Cape Cod Museum of Art, and the Art Complex Museum in Duxbury.